"For courses in introductory statistics." A Contemporary Classic Classic, yet contemporary; theoretical, yet applied McClave & Sincich s Statistics gives you the best of both worlds. 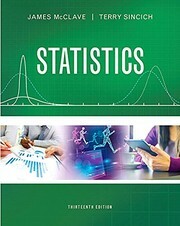 This text offers a trusted, comprehensive introduction to statistics that emphasizes inference and integrates real data throughout. The authors stress the development of statistical thinking, the assessment of credibility, and value of the inferences made from data. This new edition is extensively revised with an eye on clearer, more concise language throughout the text and in the exercises. Ideal for one- or two-semester courses in introductory statistics, this text assumes a mathematical background of basic algebra. Flexibility is built in for instructors who teach a more advanced course, with optional footnotes about calculus and the underlying theory. Also available with MyStatLab MyStatLab is an online homework, tutorial, and assessment program designed to work with this text to engage students and improve results. Within its structured environment, students practice what they learn, test their understanding, and pursue a personalized study plan that helps them absorb course material and understand difficult concepts. For this edition, MyStatLab offers 25% new and updated exercises. Note: You are purchasing a standalone product; MyLab & Mastering does not come packaged with this content. Students, if interested in purchasing this title with MyLab & Mastering, ask your instructor for the correct package ISBN and Course ID. Instructors, contact your Pearson representative for more information. If you would like to purchase both the physical text and MyLab & Mastering, search for: 0134090438 / 9780134090436 * Statistics Plus New MyStatLab with Pearson eText -- Access Card Package Package consists of: 0134080211 / 9780134080215 * Statistics 0321847997 / 9780321847997 * My StatLab Glue-in Access Card 032184839X / 9780321848390 * MyStatLab Inside Sticker for Glue-In Packages "
978-0134080215 PDF is available as a free download.